Event DEPARTMENT OF ELECTRONICS IN ASSOCIATION WITH ECELL-SAKEC OFFERS AN INTERNSHIP OPPORTUNITY ON “SYSTEM AND NETWORK ADMINISTRATION”. Are you interested in the upkeep, configuration and reliable operation of your computer system? Do you want to practically learn and become knowledgeable in monitoring system health and allocation of system resources? 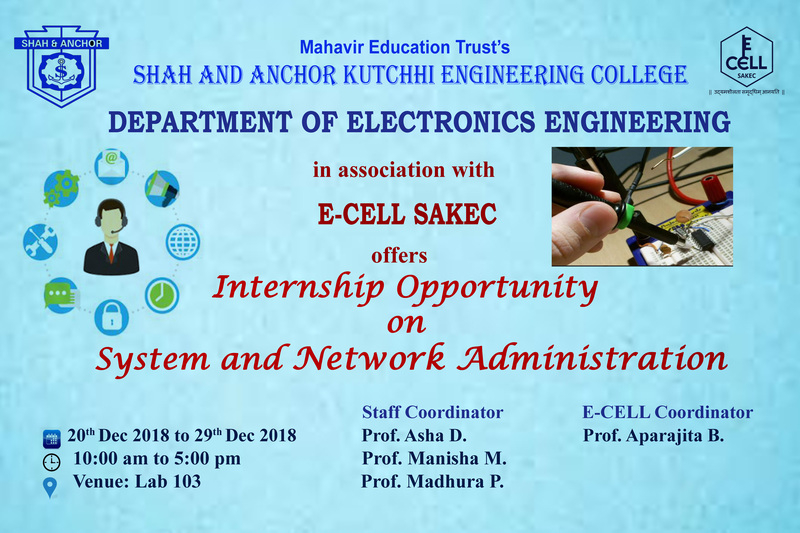 Department of Electronics Engineering in association with E-Cell SAKEC is organizing an Internship Opportunity on “SYSTEM & NETWORK ADMINISTRATION”. This internship program aims at giving Hands On training to the students. The best five performers will be shortlisted for onsite training in prestigious firms which can be converted into job offer on performance basis. Course Prerequisite: Basic knowledge of personal computer, CRO, DSO, OS, LAN & peripheral devices. Interview will be conducted for the registered students. After clearing the interview based on course prerequisite, students will be shortlisted for internship opportunity. If required the students will be guided for obtaining the learning resources. In Campus and In Companies: Students will be given opportunity to learn and do system administration and work on live project. On successful completion of given task participants willbe awarded Internship certificate. Duration 20th December 2018 to 29th December 2018. Registration Fee No registration fees required.